haha. i took this photo by the roadside while waiting for the green lights to turn green. 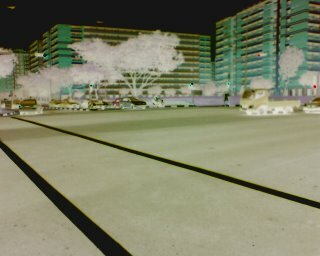 it was actually morning, but because i used the "negative effect" on my handphone, this photo looks like a night city with pretty lights. Even the trees look like clouds. come from a planet called Earth. 2. I am listening to..
myself, money, beauty, & love. to kill someone has been cancelled. a tooth when i was in primary two. crazy things when they are bored. satay and bbq chicken wings. i hug my pillow and shut my eyes again. fun and i love them.